In web applications is easy to find grids being used to display a data sequence, because its format and layout allows an easy analyze of massive data. 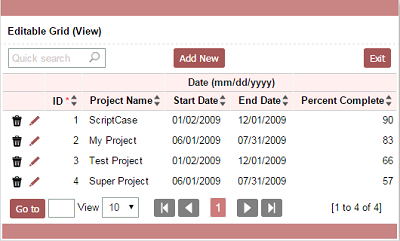 The format that displays records in rows and columns has an easy viewing, acceptance and assimilation by the user. In any programming language, the grids are mainly used in reports since its format allows to implement other resources, such as grouping, totals and summary . In addition, the format is optimized for printing and it helps the standardization of screens. For this reason, the grids are considering the best option to analyze and compare data. Editable Grids are on step ahead of the other regular Grid, that is because it will not only show the data but will allow you to edit the information from the report, all the CRUD (Create, Read, Update and Delete) options are available. As the Grids have a friendly view, it is very common that they are also used for editing records on a large scale. This feature can be used every time you need to modify a large number of records, especially in data entries. Consider the following situation: Many people need to have their phone numbers changed, so that the user must access a report, and click on the registered records one by one, then enter on their respective registration screens to make the changes. The time spent to do that will be great, so that is why a grid with editable fields could be a great solution in this case. With editable grids you can retrieve a huge amount of records and edit the fields in the grid itself. Using an intelligent model you can edit multiple records at once, this means saving time and more flexibility in the process. The major problem of the editable grid is the complexity to implement and it can be one of the obstacles for include it in the project. But PHP projects has several resources already available for working with grids. Multiple Record: It will show as many records as you want and you can edit then all at the same time using a single button. Editable Grid: It will show as many records as you want and you can edit line by line (record per record). Editable Grid View: It will show as many records as you want and to edit a record you need to enable editing by clicking on an icon on the side of the line. The editable grid allows the end user to edit a record row of Grid via a simple form in a modal window. An example covering the editable grid form. With Scriptcase you can create editable grid quickly and easily. Using the native features of the tool you can create them in minutes. Once the database table is selected, Scriptcase automatically creates all the PHP and HTML structure, methods and interactions for that table to edit the fields from the grid. It represents increased value to your project. Learn more about this and other features that Scriptcase can do for you. Download now the free version of our tool and get started today to enjoy all the benefits it offers.